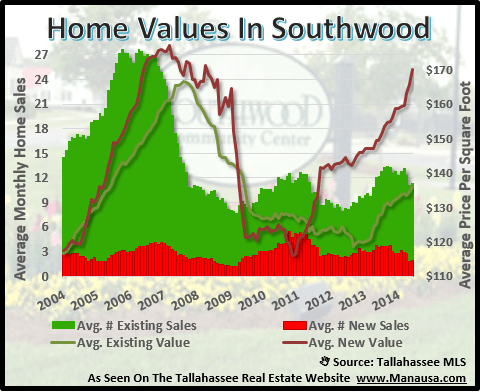 June was a very busy month for Southwood, the most popular neighborhood in Southeast Tallahassee. In fact, of all the property searches performed on the Tallahassee Real Estate Website this year, the most often requested community is Southwood. So far in 2014, there have been 62 homes sold in Southwood, with 22 of those recorded in the month of June (and we have not yet seen the last day of the month). The average sales price in June was $342,000 and the average value of $144 per square foot.That makes the average home size of just over 2,370 square feet. Note: We have just published the lis pendens and foreclosure reports for May 2014, you can see them on the Tallahassee Foreclosure Reports Page. This month's home sales report for Southwood shows continued improvement for home values which are up roughly 11% since this time last year. Currently, there are 87 homes for sale in Southwood, representing just less than 8 months of supply. 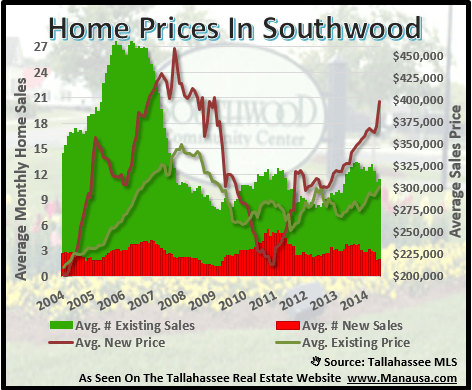 The rate of home sales has slowed somewhat in 2014, but sales are strong enough to make Southwood the second most active neighborhood in the Tallahassee real estate market. Our first real estate graph shows this popular SE Tallahassee neighborhood is averaging just under 11 home sales each month, which is lower than we reported in our December 2013 housing report. In the graph above, we see the number of monthly home sales measured on the left vertical axis, where the red bars show the number of new construction sales and the green shows existing home sales. The average sales price is measured on the right vertical axis, with both red (new) and green (existing) recorded as well. Thus far in 2014, we are seeing higher sales prices for existing, and new construction is soaring. 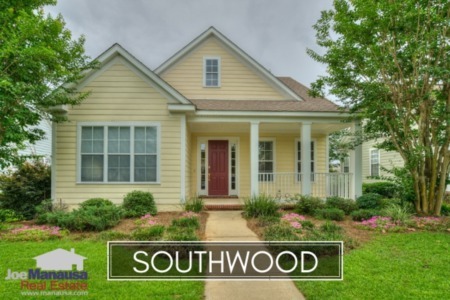 Average home values in Southwood are definitely on the rise, after bouncing around a market bottom from 2009 through 2012. New construction is selling near $170 per square foot, and so long as demand can sustain it, existing home values should continue higher. If you are thinking about selling a home in Southwood, you can use this rule of thumb to determine your value. If your home is the "average home in Southwood," then you know your value. You can make adjustments above that amount if you have premium appointments or location (i.e. on the golf course), and the opposite is true if you were super conservative when you purchased your Southwood home. The following map plots the current list of homes for sale in Southwood. You can hover your mouse over a home's location and it will show a picture of the property, and by clicking on the image you can discover the details about the property. 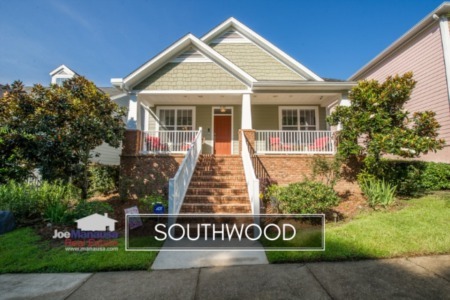 On thing you will notice about the recent home sales in Southwood is that there have been no distressed properties sold through April 20th of this year. Could this be a sign of stabilization and strength in the months and years to come? I hope you enjoyed this report on Southwood homes for sale, please drop me a note if there is something else you would like to know about this popular SE Tallahassee neighborhood.